Area : 147181 Sq. Km. Geography : Situated between China in the North and India in the East, South and West. Economy : Nepal has basically an agro based economy. About 85% population depends on agriculture and 60% GDP based on Agriculture. Thereare hardly any big industries excepts small factories and handicrafts and cottage industries. 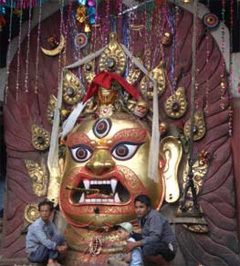 Tourism is becoming a major industry in Nepal earning 15% of National Income. Political System : Federal Democratic Repubic Nepal. Electricity : 220V/50Hz. (sockets have either three round pins or two round pains. Only 15% population has excess to the electricity. Working Hours : Government offices within Kathmandu valley open from 10.00-17.00 in the summer and from 10.00-16.00 in the winter. Outside the valley the government offices open from 10.00 -17.00. Bank : Private and Government Banks are open 0930-1500 from Sunday to Friday.Services including bank transfer, currency exchange, ATM service. Etc. Official Holidays : Except public holidays Saturday is weekend holiday in government. Most Private business are closed only on Saturdays. Nepal, independent land lock country is bounded on the north by Tibetan Autonomous Region of China and on the East, South and West by India. It covers 0.1% of the earth. The length of the kingdom is 885 Km east west and its breath varies from 145-241 Km north south. It is divided into three main geographical regions. Himalayan Region: It covers only 13% of the total land area of the country. It includes 8 of the 14 highest mountain in the world which exceed an altitude of 8000M including Mt. Everest, Manaslu, Annapurna, Dhaulagiri and others. This region is popular for Hiking Trekking, Mountaineering. Mountain Region: It covers about 68% of the total land of the country. Kathmandu and Pokhara valleys and others are situated in this region. 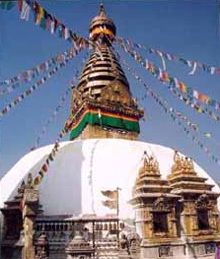 This region is popular for culture and old monuments, temples and stupas including UNESCO Heritage sites. This region is inhabited by 48% of the total population. Terai Region: It covers about 17% of its total area and lies on the southern part of the country famous for dense forest and fertile land. Chitwan National Park and Lumbini lies in this region. This varied landscape has a population about 22 million made of various races and ethnic groups and culture in the different region and are diverse in that many have their own languages and customs. Nepal is unique in that many people have managed to coexist peacefully despite their different languages (over 70 languages and dialects), cultures, and beliefs. Hinduism and Buddhism are the prominent religions here but there are also Muslims, Christians and others. Nepal is blended of nature and human efforts. Nearly 18% of Nepal's total land has been designated protected area as national parks or wildlife reserves or conservation areas.8 National parks, 4 wildlife reserves, 3 conservation areas and 1 hunting reserve within the area of 147181 square kilometers of the Kingdom. There are over 180 species of mammals including the endangered species of Royal Bengal tiger, one-horned rhinoceros, snow leopard as well as the Gharial crocodile, which all dwell in the jungle regions. There are also over 848 species of birds, which is about 8% of the world's total. Some are endangered like the Bengal florican, Sarus crane and swamp partridges.